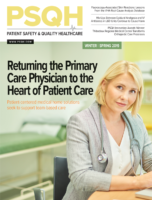 Featured in this month’s PSQI Online Spotlight: Patient safety coaches explain how to involve patients in their care decisions. The Joint Commission will only track the number of C-sections done on nulliparous, term, singleton, vertex (NTSV) births—procedures performed on first-time mothers carrying a single baby that has its head facing down at the onset of labor. During the transition between care providers, the potential for patient harm grows due to the transfer of inaccurate, incomplete, delayed, misinterpreted, or otherwise unhelpful information about the patient’s condition. The Joint Commission (TJC) released a new report on January 28: Quick Safety 47: De-escalation in Healthcare. This report discusses better training to mitigate such situations. The accreditor writes that as violence against nurses, doctors, and healthcare staff becomes more prevalent, the need for mitigation is greater than ever. Violence and assault are perpetual risks for anyone working in healthcare, particularly nurses and nursing assistants.